Hey guys! 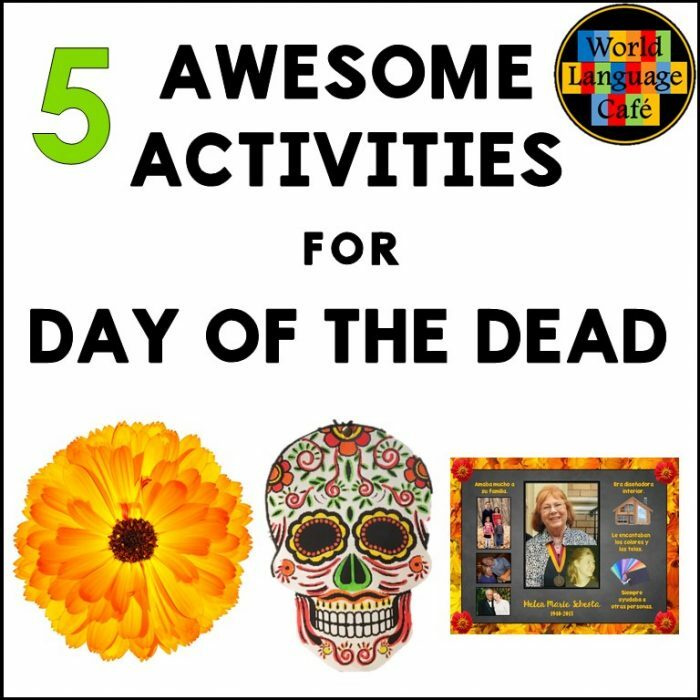 Just made a video sharing 5 of my favorite Day of the Dead activities for Spanish class. It’s too big to host on my blog (boo hoo! ), but you can watch it for free using the link above. 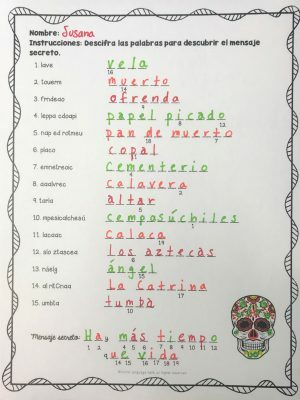 Before you click on it, sign up to get access to a special Day of the Dead free resource, a secret message word scramble. After you sign up, check your email for the password and access link. 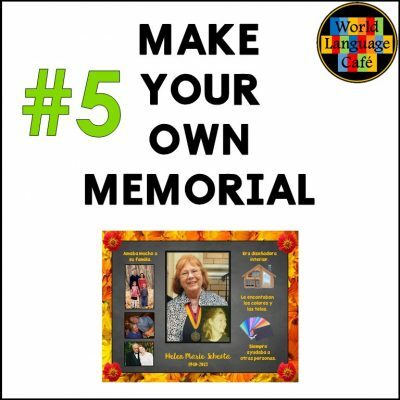 Although many teachers feel this might be emotionally challenging for students to make a memorial honoring a loved one, many students say that it actually made them feel a little better to take time to remember the good times they spent with those who have passed away. 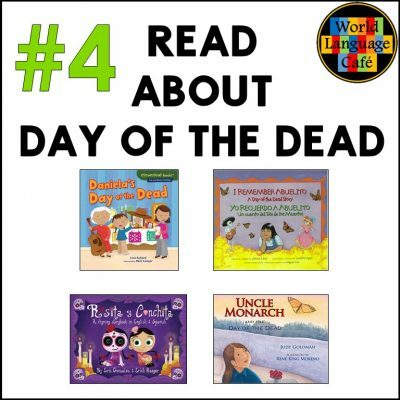 Students can make Day of the Dead memorials for loved ones, pets, or famous people or Hispanics who have passed away on paper with printed photographs and other materials that they tape or glue to the page OR they can make a digital memorial page on the computer. Photos of objects of significance to the loved one. Ex. a guitar for a musician, a hammer for a carpinter, etc. A few sentences describing what the person liked to do. Tip: Be sure to check your students’ sentences to make sure they’re correct before they write them on their final copy. Here are 4 of my favorite children’s books for your younger students. 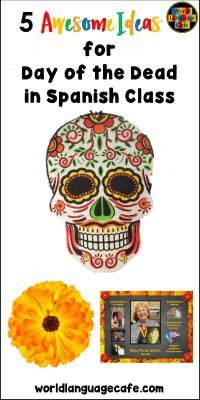 For older or more advanced Spanish students, check out this blog post about how Day of the Dead is celebrated in 5 different areas of Mexico. Divide your students up into 5 groups and have each group present about their place. Have a student recorder write similarities and differences on the board. OR Have students read this for homework and write questions to ask a partner in class the next day. “Ofrenda” by Pedro Guerra is the perfect song for Day of the Dead. 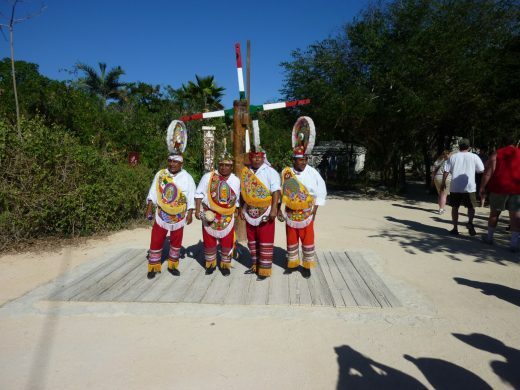 In it, he sings about the various offerings that you leave to entice the spirits of your loved ones to return. Love how he describes leaving items encapsulating all 5 senses to attract the spirits (food, drinks, incense, candle light, etc). I don’t know about you, but I love crafts that are simple, cheap, and easy to clean up. 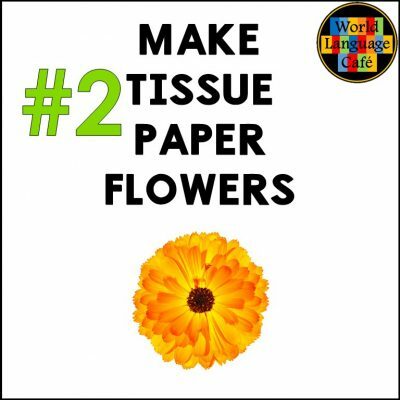 All you need is yellow and orange tissue paper, green pipe cleaners, a stapler and scissors. Best to watch the video to see how this is done. But these literally take 5-10 minutes. Very simple! 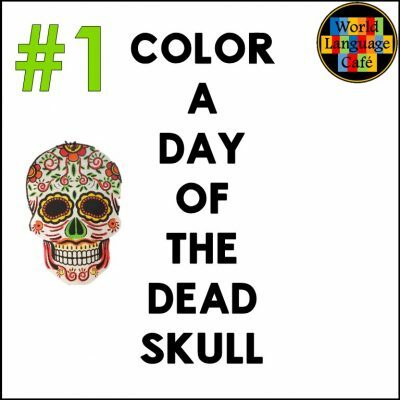 Google Day of the Dead coloring pages and you’ll find plenty of skull images. Print out 4-5 of your favorites so students can choose the one they like the best. All you need are the copies, scissors, and markers. These make great class decorations or art projects for students to bring home. 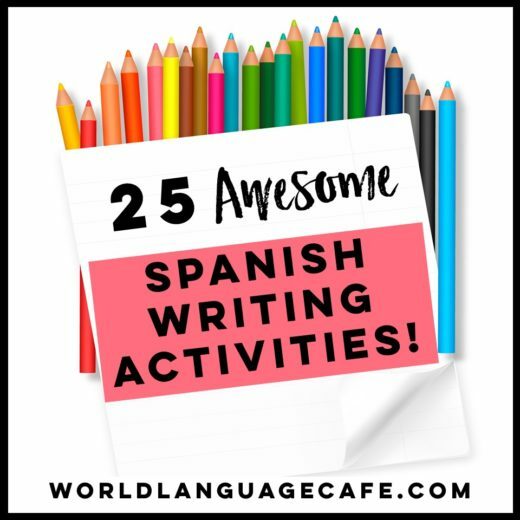 Hope you’ll try one of these ideas in your Spanish class this year! Enter your email below to get your Secret Message Worksheet (plus 10 other free resources) in my Free Resource Library. There are some Amazon affiliate links in this post, but I only recommend things that I feel are genuinely worth your money. The small amount that I make from these links helps keep this blog running so I can continue to share ideas and teaching tips with you.